This cottage will make a wonderful family summer destination. Has stone fireplace, new appliances, sun room, family room. New hardwood floors. Two boat docks. New multi decks lake side. 500 acre lake. Great for swimming, fishing and all summer sports. Oversized garage to store everything. Deck off upper master suite. It is in pristine condition and ready to move in. I has four bedrooms and 2 1/2 bathrooms, a separate entry off the lake to keep the sand out of the house. Too many amenities to list. For sale: 80' of beach frontage on Font Lake - Lot cleared for building: Lot 7 on Pine Chip Road, turn just past the Sub sign on the Donegal Bay Road. Marge Armstrong, (231) 448-2143 or (941) 729-2637 (cell). Great view of Lighthouse Tower and entrance to Beaver Harbor. Lot For Sale 125ft on Michigan Ave. 96ft on Gull Harbor Drive. $275,000.00, OBO/Terms. Also included older home 3 bdr / one bath / full basement / new well, for free with lot. Iron Ore Bay lot. 200 ft.
Just past the lighthouse, the lot has one of the nicest views on Beaver Island. Iron Ore Bay sits just to the right of this lot, which has a great view of the Fox Islands to the South. This lot sold for $205,000 in 2008, and is now investment priced at $150,000. Contact Mike Scripps at 231-855-1759, or Ed Wojan at 231-448- 2711. Build your summer place or year-round home on Donegal Bay’s “Sunset Corner.” Lots 537 & 538 feature 206.76 feet of gorgeous Lake Michigan frontage with barefoot sandy beaches. Secluded building site sits in a natural bowl-like setting, surrounded by trees. Spectacular view of Lake Michigan and the Beaver Island archipelago. Five minutes to ferry, shops and downtown/harbor events. Selling both lots together, available for $295,000, reduced from $325,000; individual lots now $160,000, reduced from $175,000 each. Tom Koetsier, Koetsier Realty, (616) 550-4447. Landmark restaurant and pub on Beautiful Beaver Island. Exciting opportunity! Landmark restaurant and pub on Beautiful Beaver Island. Donegal Danny's, a favorite gathering spot for locals, a tradition for visitors. The fully equipped kitchen boasts a very diverse menu. Firmly established clientele year-round. This business offers the opportunity to live and work on this beautiful island. Miles of white sand beaches, unspoiled natural beauty. The current owners have solid books to prove income and are willing to share their experience with new proprietors. Paradise Bay lot. 300 ft.
299.5 feet of beach frontage with great views of the harbor, Garden and Hog islands. It has a triangle shaped piece across the road large enough for a pole barn or large garage. Private and secluded, yet just a mile from town. A natural building site is high and dry on top of a small bluff. Willing to sacrifice for $130,000. Contact Mike Scripps at 231-855-1759, or Ed Wojan at 231-448- 2711. Sand Bay lot 100 ft. Deep lot, very quiet, private, secluded. Only 10 minutes to town. Ready to build with health department approval already on record. Sand and gravel beach, clear water, lots of wildlife – loons, terns, eagles, deer, even an occasional beaver. Great night skies, sunrises, moonrises, and only 100 feet away from a quarter mile of fine township park beach. 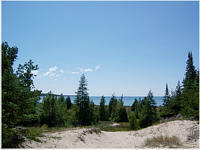 Lowest price offered on a sand bay lot at $ 130,000. Contact Mike Scripps at 231-855-1759, or Ed Wojan at 231-448- 2711. Beautiful, wooded, great building site; $45,000, please call (231) 409-1214. $55,000; 16x18 rustic cabin (no electricity or water); Apple orchard and deer blinds; great location for hunting; ½ mile north of Fox Lake Rd; contact: Mike Eicher (248) 766-4205. For Sale by Owner: For Sale 40 Acres Interior Wooded, Hunting 32370 Kings Hwy Great hunting area w/combo wetlands, no immediate neighbors, and State Land across road. Nestled next to Jordan River swamp/headwaters. Deer runs thru w/cedar forage. Includes fully-insulated, roughed-in, 2-story structure w/rough-electric ready for generator supply (generator included). No well/septic, but outhouse supplied! Make offer! 231 448-2454. 175 feet of frontage overlooking Garden Island and Hog Island. Pebble and sand shoreline near Lookout Point. Call (616) 636-5685. NOW CONSIDERING OFFERS on two of Beaver Island’s remaining large-sized shore parcels. The parcels are separate, 20 acres each, fertile, protected, with excellent building sites, 660' shore each, road frontage. One is located on the north edge of Sand Bay, overlooking Conn’s Point. The other is secluded, north of Conn’s Point. Contact ezfave@verizon.net or (734) 944-0544 for details. WANTED: Reasonably-priced 10 - 40 acres on island; partially cleared, dry, with or without house and barn. Harley 989-661-2354. Watch the sun rise over Lake Michigan! 3 BR, 1¾ bath, at Sand Bay. Sandy beach, 2 lots: 1 w/ recently remodeled home and garage, 1 w/ large pole barn. Just appraised at $285k. Call (231) 448-2034. Lot 24 of the Western Shores Plat: 3.5 wooded acres, with 250' frontage on Greiner’s Bay. Eight miles from town on Mrs. Redding’s Trail. Very deep and private. Land contract possible with acceptable down payment. Contact owner Victor Dmitruk at (269) 207-2970 or villpsych@aol.com.